I have always loved gardening. Don’t know why, particularly, just always have. Ever since I was a little kid I have liked growing things. I even maintained a large vegetable garden all during medical school. In fact, I seriously considered pursuing horticulture as a field of study when I was in high school thinking about college, and was a biologist well before I was a doctor. I suppose it’s why I talk alot about my garden and woods and hostas. It’s why, too, I am excited about the prospect of reforesting LaGonave with a quarter million trees. 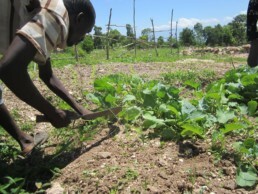 Another way we plan to transform La Gonave is to virtually fill it with family gardens and farms. These gardens and farms will help in so many areas: providing food for the family, a source of occupation and income. They will provide a sense of dignity and pride of ownership. They will also be beneficial to the island from an ecologic and climatologic standpoint, helping to condition hard soil and prevent runoff of the heavy rains that come. Restoring the island’s once lush and dense vegetation will provide a cooling effect to the island, which today is consistently higher in temperature than the mainland. 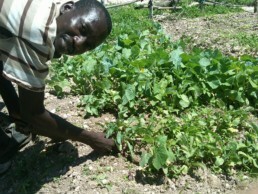 Thanks to several generous grants of vegetable seeds, hundreds of family households have gardens today. I visited about a dozen-or-so of them last month and was energized! Vegetable gardens were springing up seemingly everywhere, and were healthy! What struck me as much as anything, though, was the obvious sense of pleasure and pride that the families took in their gardens. When we showed up to a home and asked if we could see their garden, you could tell… they were more than eager to show them off. In fact they would walk us to where their garden was and would start working in it, to show us how they worked the ground with their machetes. It was, and is clear to me that there is something about gardens. Gardens have value beyond the dirt and seeds and even the food. Gardens are about hope and expectation. Haitians love gardens. We will invest in gardens.